Patricia Lee Lewis, who will act as moderator of the panel on Small Presses this year, returned recently from southern Africa where she led a two-week writing and yoga retreat in Zimbabwe. The photograph shown here of a Matapos Hills cave drawing that is 6,000 years old was taken by Patricia. 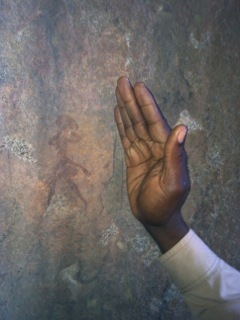 A local guide shades the image of a woman with his hand so that it can be seen better. Read about Patricia’s travels and see more photographs.